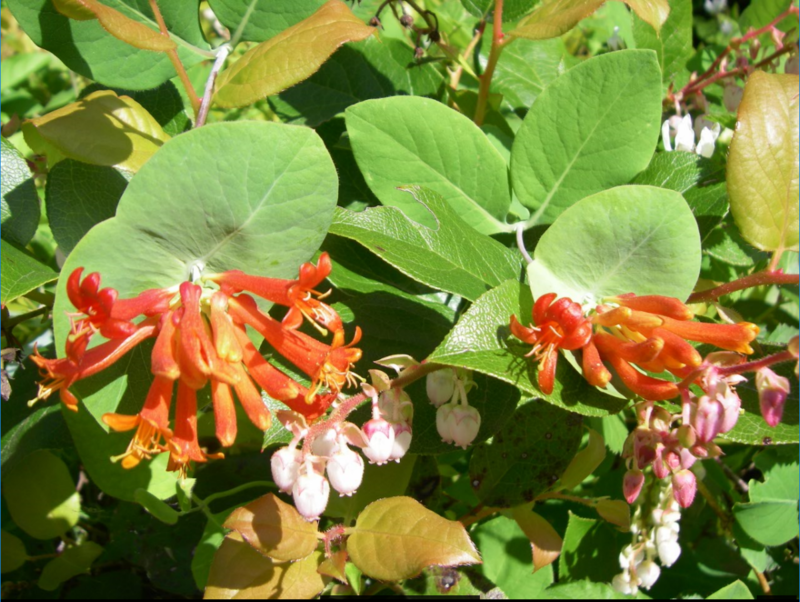 Names: Honeysuckles have long been a garden favorite, grown mostly for their sweetly-scented, nectar-producing flowers. 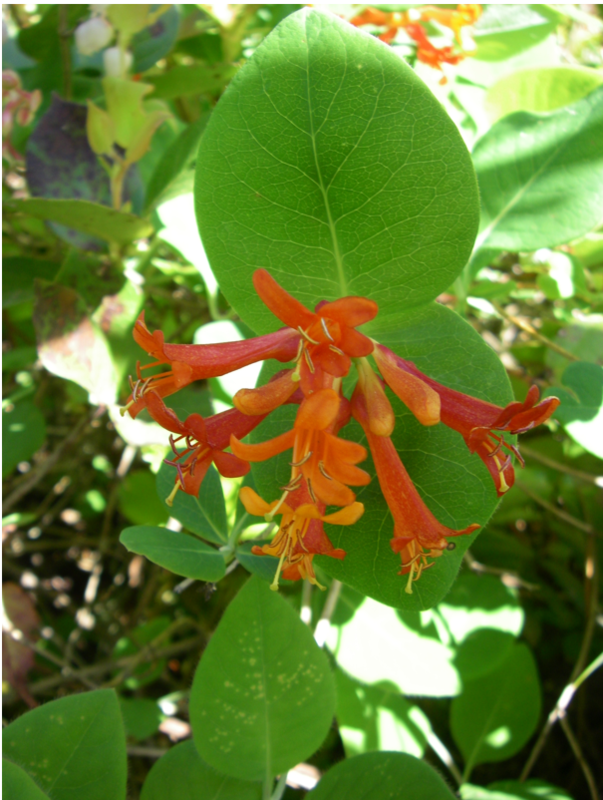 The common name, honeysuckle, comes from the fact that children enjoy sucking nectar from the base of the flowers for a sweet treat. 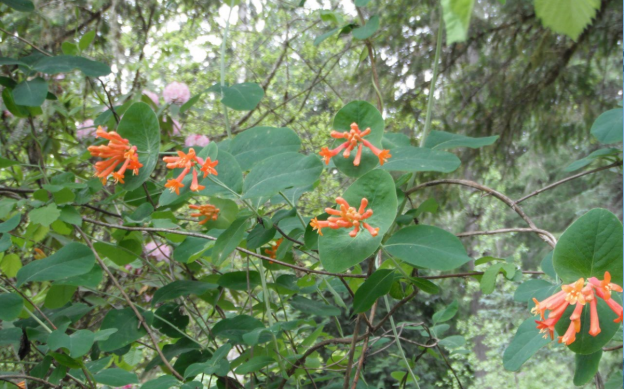 This species is also known as Orange Honeysuckle, Northwest Honeysuckle, or Western Trumpet. The name Lonicera is derived from Adamus Lonicerus (Adam Lonitzer), a German botanist, author of the herbal, Kräuterbuch (1557). Ciliosa, which means having small, fringe-like hairs like eyelashes, refers to the hairy edges of the leaves. Relationships: Plants in the genus, Lonicera, are often twining vines but many are arching shrubs. There are about 180 species in the Northern Hemisphere, with about 100 from China, ~20 from North America, and the rest from Europe or North Africa. 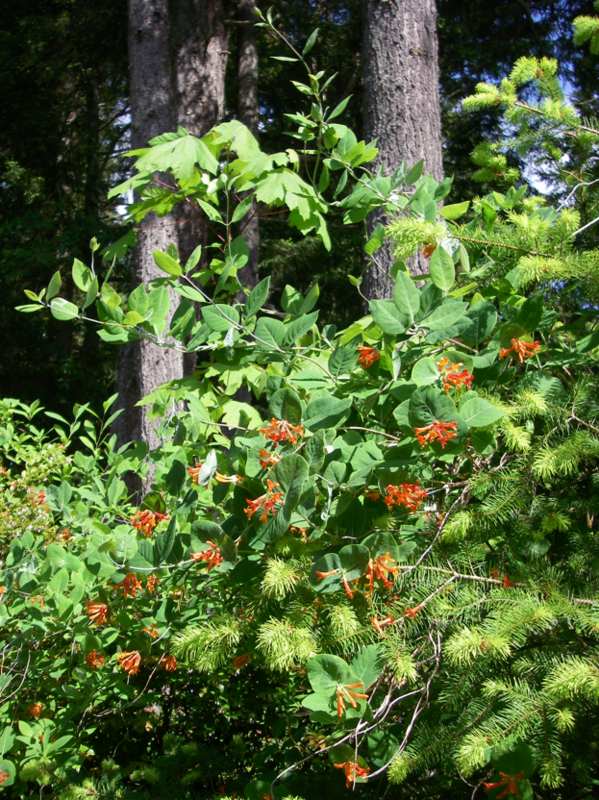 A similar species, Limber Honeysuckle, L. dioca, found in British Columbia, has light yellow flowers. 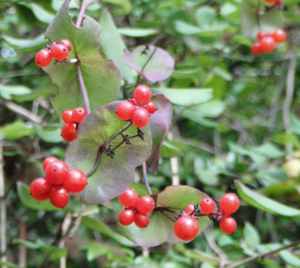 Unfortunately, many invasive ornamental species of Lonicera may be found growing in natural areas. 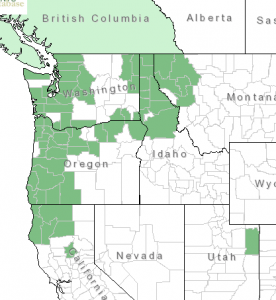 Distribution: Trumpet Honeysuckle is native from British Columbia to northern California, mostly west of the Cascades; but also can be found in the Idaho panhandle and neighboring Montana; and isolated communities in Utah and Arizona. 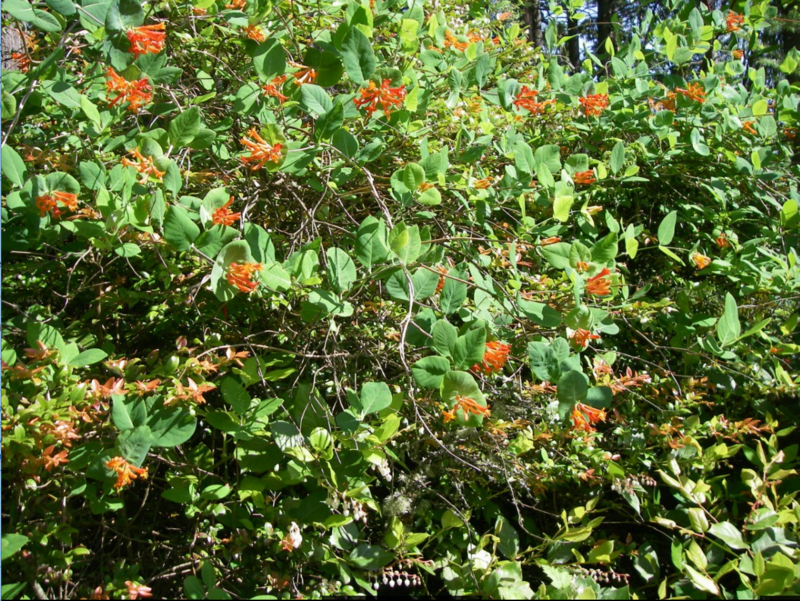 Growth: Trumpet Honeysuckle is a twining or trailing vine climbing up to 18 feet (6m). Habitat: It is found in open woods, or along edges of forests. Tubular flowers flare to 5 lobes at the end. Diagnostic Characters: Although the leaves of young seedlings are often very hairy, similar to Hairy Honeysuckle, mature opposite leaves are mostly smooth, large, and oval with the end-pair on each twig joined together at their base; Terminal flower clusters arise from these disc-like leaves; bearing several orange, trumpet-shaped flowers that flare to 5 lobes at the end. Fruits are bunches of orange-red, translucent berries. Twining, freely branching stems are hollow. The tubular orange red flowers are hummingbird-adapted. 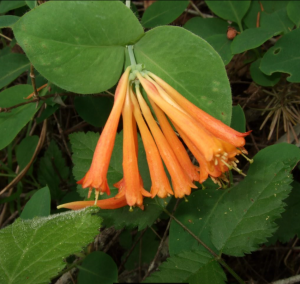 In the Landscape: In the wild, Trumpet Honeysuckle, climbs or rambles over trees and shrubs. In the garden, it needs support and may need a little training to grow on a trellis, arbor, or along other structural elements in your outdoor living space. With its orange, trumpet-shaped flowers, it is the classic hummingbird flower and should be included in any wildlife garden. Phenology: Bloom time: May-July; Fruit ripens: September. Fruits are translucent red berries. Propagation: Sow seeds as soon as they are ripe in a cold frame or stratify for 90 days at 40º F (4º C). Cuttings root easily; they are best taken of half-ripe wood in July or August or mature wood in November. Use by People: An infusion of the leaves or bark were used for medicinal purposes, mostly for womb trouble, to stimulate lacteal flow, a contraceptive, colds and sore throat, and tuberculosis. It was also used externally as a strengthening tonic, to bathe children with epilepsy, and to bathe little girls to make their hair grow long and sleek. The stems were used for building materials; the fiber for twine and thread. And of course, the flowers were sucked by children for the sweet nectar! Use by Wildlife: Trumpet Honeysuckle is known as Ghost’s Swing or Owl’s Swing in Coast Salish languages, the Snohomish say the crows swing on it. The flowers are extremely attractive to hummingbirds. The orange-red berries, although not a favorite, are eaten by a variety of birds including robins, juncos, flickers, and finches. 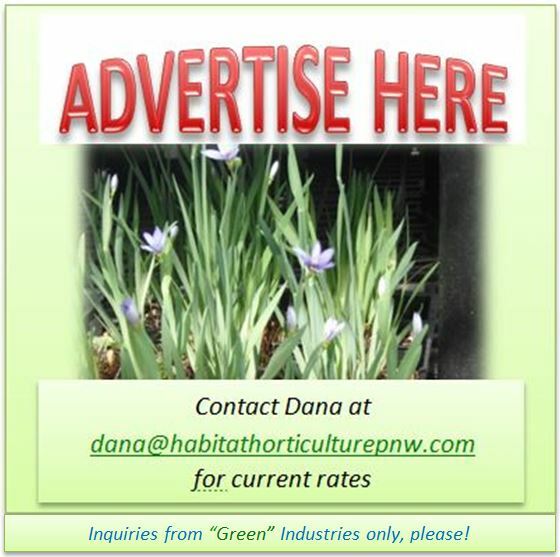 This entry was posted in Deciduous Shrubs & Vines on January 16, 2017 by habitatdana.